With special guest host, Zoe Coombs Marr. A night of prehistoric pop culture! Everybody loves dinosaurs, but do you love dinosaurs the most? 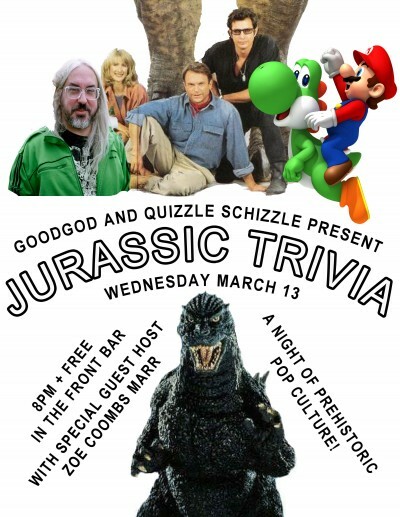 Flex your pop culture muscles with a whole night of trivia devoted to DINOSAURS and their prehistoric pals – from Bedrock to Was (Not Was) to Yoshi! This is sure to be a popular night – we highly recommend making a booking for dinner through The Dip to ensure that you get a table, as walk-up space will be extremely limited. More info on The Dip, including bookings, can be found at thedip.com.au.